At BB crafts, the glitter tulle fabric we provide is worth your investment for it. This fabric can prove to be really amazing for the people who are planning to tie the knot. 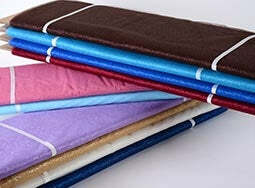 This kind of fabric can easily be utilized for decorations in weddings and other celebrations. The shiny and glittery look of this fabric makes it look more classy and perfect to be used for wedding and party decorations. We have great offers for our customers so that they could experience using the finest ribbons and fabrics that we offer. The most beneficial part about shopping with us is that we provide wholesale glitter tulle but we never make any sort of compromises with the quality of the fabrics and other products. So, in case you are searching for some reasonable options then you can come across the best deals at BB crafts.